Wikieducator.org (2008) describes CAI as a self-learning technique, usually offline/online, involving interaction of the student with programmed instructional materials. CAI uses a combination of text, graphics, sound and video in enhancing the learning process. The computer has many purposes in the classroom, and it can be utilized to help a student in all areas of the curriculum. It also refers to the use of the computer as a tool to facilitate and improve instruction. CAI programs use tutorials, drill and practice, simulation, and problem solving approaches to present topics, and they test the student’s understanding. According to Arnold (2008) Computer-Aided Instruction (CAI), also known as computer-assisted instruction, a diverse and rapidly expanding spectrum of computer technologies that assists the teaching and learning process. He added that CAI applications include guided drill and practice exercises, computer visualization of complex objects, and computer-facilitated communication between students and teachers. According to Wikieducator.org (2008) typical CAI provides: text or multimedia content; multiple-choice questions; problems; immediate feedback; and notes on incorrect responses. According to the Sen (2012) main advantages of Computer-Assisted Instruction (CAI) includes: Immediate feedback that keeps students interacting and eager to keep trying; Active participation, even weaker students are obliged to participate actively and often remain passive in lectures; no annoyance, the computer will wait patiently for an answer and does not express annoyance with wrong response; Graphics facility, Interactive graphics make it possible to sample many more illustrations that could easily be shown in a textbook; Mathematical calculations can be done as readily for realistic examples as for artificially simple class that can be solved analytically; Large volumes of data can be handled with accuracy and without drudgery; and Enrichment of course: The novel technique provides enrichment of course through added variety. Shao (2012) examined the application of multimedia courseware to vocabulary acquisition and explore the effectiveness of multimedia application among Chinese EFL learners. The result of the study revealed that learners held highly positive attitudes to the application of the multimedia software. And there was also clear evidences showing the effectiveness of the application of multimedia to the development of vocabulary acquisition. According to Diculen (2009) many schools in the Philippines at present are now using computers in the delivery of lessons called the computer-assisted instruction (CAI) and these developed CAI lessons are learning tools that greatly help the students where they are challenged to discover more because the CAI process resembles the exploratory and discovery approaches of teaching. The literatures and studies gathered and presented in this chapter gave the researcher insights, facts, and adequate information that will serve as the basis, guide, and reference that are relevant and necessary in the development of CAI System. The related studies on the development, teaching strategies, design guidelines, effectiveness multimedia where learners held highly positive attitudes to the application of the multimedia software provide researchers the details and evidences that will guide the researcher on how to design and develop an excellent educational tool. 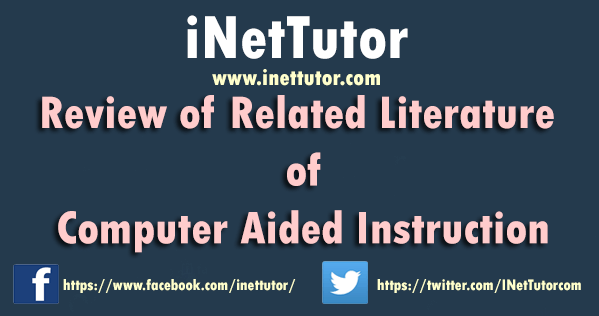 The review of literature used to support additional materials to assist the researcher in the development of the CAI system.